The Spanish Federation of Associations of Schools of Spanish as a Foreign Language (FEDELE) has released the latest edition of its El Informe Sectorial survey, which the organisation has been conducting since 2011 with the goal of tracking the Spanish language teaching sector in Spain. This year’s survey encompasses responses from 78 schools, all of which possess accreditation from Instituto Cervantes. The survey data is compared to responses from the recent years in order to chart longer-term trends. The survey data shows an increase from last year, as well as steady growth over a four-year period, in both the numbers of students arriving in Spain for Spanish courses, and for the volume of student weeks booked. Total enrolment expanded from 79,277 students in 2013 to 97,578 in 2016 – a 23% increase – and total student weeks from 231,207 to 309,004 over the same period (34% growth). In terms of year-over-year growth between 2015 and 2016, student weeks increased by 7.4% and total enrolment by 11.5%. As of 2016, the vast majority (55%) of students came from five countries: Italy, Germany, the US, France, and the UK. The top ten sending countries are rounded out by the Netherlands, Austria, Switzerland, Denmark, and Russia. Despite the overall gains, student numbers dropped from several important sending markets, including Russia, Ukraine, the Czech Republic, and the Middle East. The survey offers no specific explanations for drops in bookings, however school directors were asked their impressions of the effects of currency changes, political fluctuations, or terrorist threats on the choices of students, and about 85% agreed that such factors have a strong impact. In particular Russia, which was previously a steadily growing market, has seen its currency weaken considerably in recent years and this appears to have had an impact on 2016 enrolments. More positively, observers have noted that Spain is benefiting from being one of the most stable countries during a time of widespread political uncertainty. In addition, the economic crisis that roiled the nation between 2008 and 2016 has eased, making it still more attractive for prospective students. The overall increases in numbers are not only due to external factors as Spanish language schools have also expanded their international recruitment efforts. According to the FEDELE survey, 68% participated in international fairs during 2016, 70% participated in international workshops, and 63% made visits to international centres. At present, there are no official national or regional policies aimed at promoting Spain as a destination to learn Spanish. The survey asks school directors whether they think the absence of such a national strategy has a negative impact. About 10% of respondents agreed that lack of policy in this area has a strong impact. More than 60% said it has a minor impact, and nearly 30% said it has no impact at all. However, when asked if the lack of a national body to manage the Spanish learning sector led to problems, about 35% agreed that this had a strong impact. Spain is made up of 17 autonomous regions and two autonomous cities, which means differences in procedure, efficiency, and local governance can impact numerous activities, economic and otherwise, within the country. The survey goes on to discuss the various recruitment channels through which students arrive at their language courses. 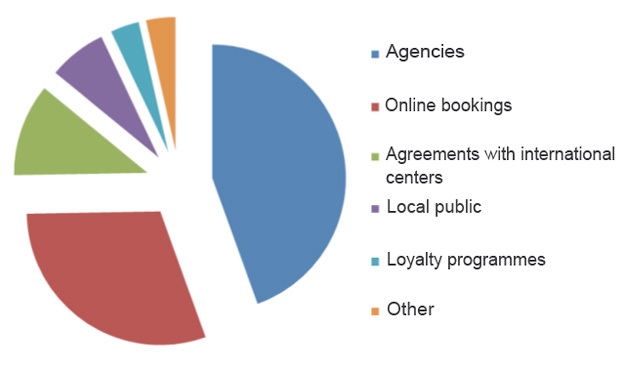 Close to half (45%) were referred through an agent or agency, while three in ten made bookings themselves online. Other channels were small by comparison. About 11% arrived via agreements with international centers, and 7% arrived locally. The survey attempts to quantify a further influence on inbound numbers, namely visa regulations in certain sending markets. China was cited as a country where such procedures are unusually difficult. FEDELE asked school directors to assess the level of impact this factor has on inbound numbers. Close to 60% agreed that problems in this area have a strong influence. 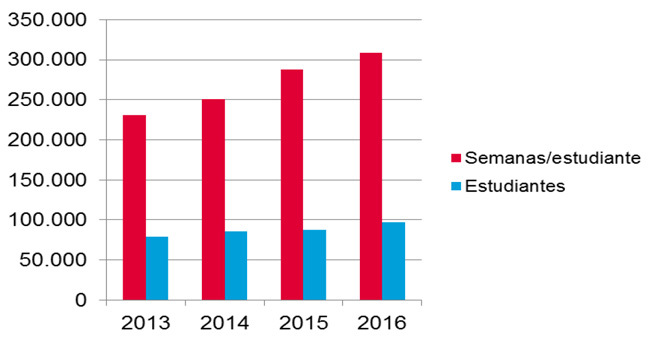 It should be noted that China was the 11th-ranked sending market for FEDELE schools in Spain in 2016, with just over 2,300 students in total (and those numbers are sharply up from 2015). Even so, the survey suggests that procedural hurdles may be a drag on even faster growth from China. Russia was also noted as country where growth in student numbers may be curtailed partly by bureaucratic obstacles. The survey tracks age distribution of inbound students, and the data revealed that slightly more than 30% were aged 12-to-18-years, about 32% were aged 19-to-25, and about 23% were 26-to-45. The latter group declined in percentage from 2015. In fact, all groupings of students above age 25 dropped, and those aged 11 or less likewise fell. In other words, growth was strongly concentrated in the 12-to-18 and 10-to-25 cohorts. The survey also tracked gender, and determined that 64% of the students were female, a figure that remained stable from the previous year. A variety of courses are available at FEDELE schools, from those that focus solely on language to those that offer local immersion, professional apprenticeships, and extracurricular activities. In 2016, about three quarters of students opted for general language and cultural studies, with significantly smaller percentages selecting courses offered as parts of other classes, such as cooking, sports, and art. Courses focused specifically on DELE (Diplomas of Spanish as a Foreign Language) preparation jumped from 3.4% in 2015 to 6% in 2016, a gain that is probably attributable to new requirements passed in late 2015 for foreigners applying for Spanish citizenship. The number of British seeking citizenships in all EU states surged as a result of the 2016 Brexit referendum. With more than 300,000 living in Spain, this may account for some of the increase in DELE-oriented classes. Course hours were tracked, and the clear preference among students was for more demanding studies. The data revealed that intensive courses – those involving more than 15 hours of class time per week – accounted for 83% of bookings. Semi-intensive courses of five to fifteen hours made up 11% of bookings, and courses of long duration involving fewer than five hours per week made up 5% of bookings. For the first time, the FEDELE survey sought to uncover whether students arrived as individual customers or within groups, and the results show a nearly even split, with 48% arriving as individuals and 52% coming through group bookings. As is generally the case when considering national trends, there was some variation in growth figures by school, with some losing ground while others gained, however overall indications are toward more student arrivals in 2017. Barring any economic or political disruption, it would make five consecutive years on the upswing for enrolment in Spain. This entry was posted in Europe, Language Learning, Regions, Spain and tagged language learning, language schools, student mobility, foreign language learning, Spanish language schools.